Jason Derlein, a software developer from Jeffersonville has become the first to win one of the top prizes on a new scratch-off game called ‘Winning In Spades’ from the Hoosier lottery. Lottery consumers have long been vulnerable to dishonest retail assistants – and there have been plenty of documented cases of ticket fraud over the years. So any measure to remove the temptation for a retail assistant to attempt to steal a winning ticket is most welcome. Big changes have been announced for the UK Lotto – the biggest the game has seen in it’s 18 year history. The National Lottery are referring to the changes as ‘exciting’, but many players are far from happy. Is It Possible To Improve Your Lottery Odds? There are a few logical, sensible ways to improve your chances of joining the big winners lists. Like choosing a decent game to play in the first place (nobody gets rich playing Pick 3 folks!). Should We Keep Lottery Winners Names a Secret? 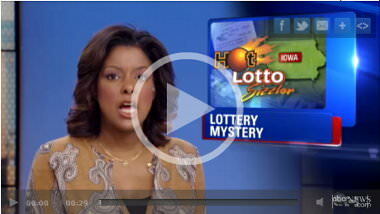 There’s a big debate happening right now in the US about anonymity of lottery winners. The lottery companies argue that it keeps everything transparent. It reassures people that nothing funny is going on if they can release details of the winners. Bob regularly went into the Flanagan Bart’s Supermarket while on business. And saw an endless stream of Powerball ticket sales being handled by Rakesh Patel (“Rocky”). It started out as a stop off at the convenience store to buy snuff. But the scratch off ticket that tempted Penelope Henritze while she was there changed their life a whole lot more than they ever imagined. This is a very odd story that keep on resurfacing once in a while. It relates back to a $16.5 prize on the Iowa Hot Lotto game, which was originally won on 29th December 2010.